As Doctor Who actor Tom Baker turns 85, Donal O’Keeffe salutes the man who was probably – with apologies to all the others – the definitive Doctor. On June 8, 1974, viewers of Doctor Who saw the mysterious alien adventurer known as the Doctor fall from his bigger-on-the-inside-and-disguised-as-a-1950s-police-telephone-box time and spaceship the TARDIS and die in front of his friends Sarah-Jane Smith and Brigadier Alastair Gordon Lethbridge-Stewart. For children who had for five years known no other Doctor than Jon Pertwee’s dashing Bondian hero, this was a terrible trauma. On screen, however, the Brigadier had seen it all before, having known both of the Doctor’s earlier incarnations. Six months later, Baker’s Doctor began an unprecedented and never-beaten seven-year on-screen run as the Doctor. The previous Doctors had all had behind them successful acting careers. The First Doctor, William Hartnell, had built a reputation for playing bullies and martinets, and was able to subvert that image as the impish and twinkly Doctor. The Second Doctor, Patrick Troughton, was one of England’s most respected character actors, and he played the character as a cosmic hobo. Jon Pertwee, the phenomenally-popular Third Doctor, was when he took the role already an accomplished comic actor. 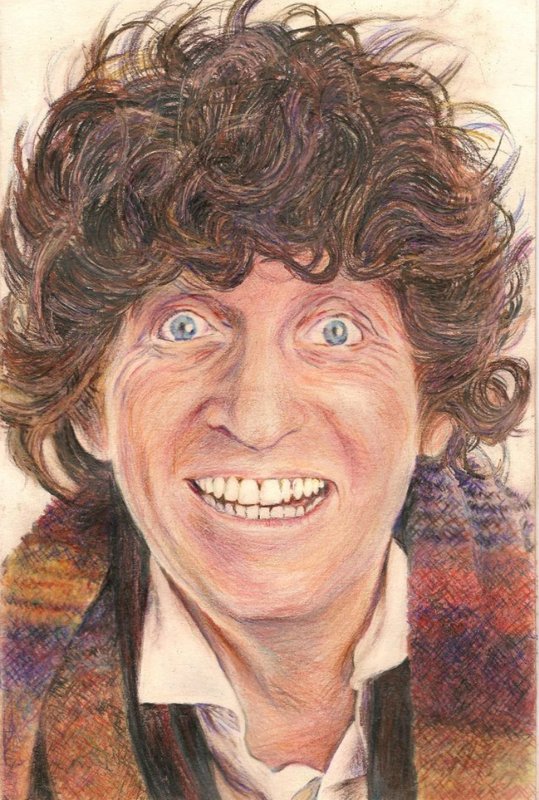 Tom Baker, as illustrated by Donal O’Keeffe. The Liverpool-born Tom Baker was a former Christian Brother who had lost his faith, and at the time he was cast as the Doctor, he was a resting actor working on a building site. Baker came almost immediately to inhabit and define the role, with his booming voice and his bulging eyes capturing the public imagination at least as much as his ridiculously-over-long scarf and his character’s love of jelly babies did. Baker’s Doctor became quickly a phenomenon. No Doctor is complete without companions, and Tom Baker was fortunate indeed in his co-stars. Arguably the most popular companion of all time, the feminist journalist Sarah-Jane Smith – played by the wonderful Elisabeth Sladen – was already a fixture on the show when Baker joined. Other companions would help to define Baker’s Doctor too. Ian Marter’s Harry Sullivan was hired to be the Action Man to an older Doctor, but it soon became clear Baker could run down corridors with the best of them, and the likeable Harry was written out. Louise Jameson’s scantily-clad savage Eliza Doolittle character Leela was an instant hit with the dads, but Baker hated the character. The robot dog K-9 will always be remembered as one of the Doctor’s most iconic companions, even if it always promised far more than it delivered. However, one companion would have a life-changing effect, not just on the Doctor, but on Tom Baker too. In 1978, the Doctor was joined on his travels by his fellow Time Lord (referred to back then as a “Time Lady”) Romanadvoratrelundar, or Romana for short. Beautiful, regal, and possessing a superior academic qualification to the Doctor, Romana was played initially by Mary Tamm, before Lalla Ward took over a year later. The chemistry between Ward and Baker was obvious on-screen, and they soon embarked on a tempestuous off-screen on-off relationship. The Doctor and Romana hold hands in Paris in City of Death (1979) but by State of Decay (1980) they can barely look at each other. They married in 1980, only to divorce 18 months later. In 1986, Baker married Sue Jerrard, a former Doctor Who editor. In 1992, Ward married scientist and author Richard Dawkins. They separated in 2016. With the possible exception of the original Doctor, William Hartnell, Baker was by far the most eccentric actor ever to play the part, and he came to revel in every opportunity to portray the Doctor in public. Baker later confessed that he found the role of the Doctor far easier than the role of Tom Baker, especially at times his own life was miserable, and he made a special effort never to be seen smoking or drunk if children might be about. “I became very proprietorial about the part,” Baker says, recalling past battles with directors. “I’d say ‘Are you telling me how to do this?’ and the guy would say, ‘Well, no, no, I’m not telling you how to do this’. And I’d say ‘You’re telling me how to do it’. “And he’d say ‘You’re taking the mickey out of me!’ and I’d say ‘Yeahhh, I suppose I am, really, but this is what happens up there. This is not Worthing. Baker’s impossibility was exacerbated by his drinking, tales of which became the stuff of legend. Baker would repair in the afternoons to the drinking clubs of Soho, where he would join legendary alcoholics like the journalist Jeffrey Bernard, the painter Francis Bacon, and most of the crew of the satirical magazine, Private Eye. By 1980, it was obvious to all that something had to change. When Baker made his by now annual suggestion that he might move on, the new production team nodded quietly and began the search for a new Doctor. Baker’s last regular appearance on Doctor Who aired on March 21, 1981, as his Doctor regenerated to Peter Davison. While Baker has returned to the Doctor in audio plays, he has – so far – only reprised the role on-screen once (if even he did). In the 2013 50th anniversary show, The Day of the Doctor, the then-current Doctor Matt Smith is in the Under-Gallery, a secret collection of forbidden artworks, and he meets briefly with the Curator, a very familiar old man, played by a tweed-clad Tom Baker. The show’s dialogue suggests strongly the Curator is a future version of the Doctor, revisiting one of his favourite faces. Matt Smith is the soul of gentle grace, allowing Baker the steal the scene. Of course Baker would later grouse that – apart from Smith – the production team didn’t make a fuss of him. And then, despite all of the efforts to keep his presence in the anniversary special a secret, Baker confirmed his involvement before the show aired. In the end, it didn’t matter. It’s a very affecting little scene, and a powerful tribute from Doctor Who to the man who would – arguably more than anyone – define the role. “It changed my whole life,” says Baker. “People call me Doctor locally. It was the greatest thing that ever, ever happened to me. Tom Baker was once asked his favourite Doctor Who memory. “I went to say something to him and I could see him so close to tears that he couldn’t speak. And he shook his head, as if to say ‘Don’t go on, don’t remind me’ and he just did a [thumbs up]. Such a common thing, isn’t it, but suddenly backed up with such an expression on his face, through his tears, that was a knighthood. Tom Baker, born January 20, 1934.